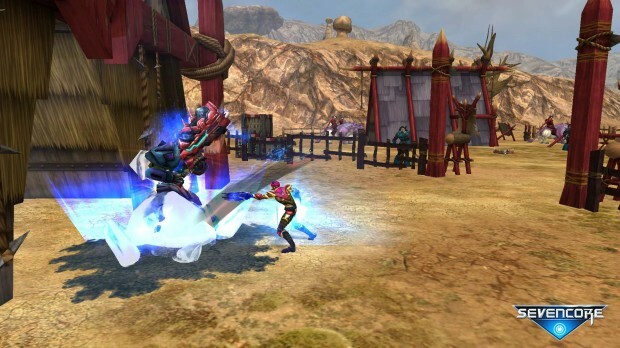 Sevencore, Webzen’s free-to-play MMORPG featuring mounted combat, will undergo maintenance today to bring the latest content update to live servers, both English and Spanish. Once live, the update adds the brand new Assassin class to the game. Assassins specialize, as you might have guessed, in quick attacks that have high chances to crit and high dodge rates to get themselves out of trouble at the first chance. Assassins will take up one of two weapon types. Claw weapons give the Assassin higher crit chances and will be useful for encounters with multiple enemies, while dagger wielding Assassins rely more on cloaking and sticking to the shadows to deal heavy dagger damage in single target fights. With this update, Sevencore is also raising the existing level cap of 60 all the way to 80 (English Server) and opening up a new level 80 zone called Ancile Islands. To celebrate, Webzen will be hosting a Dungeon Runner Event from now until January 27th. Talk to the quest NPC at Delos, run the dungeon, and receive your special prize. You can check out the official (yet very brief) announcement here. Okay..seriously..who the hell is actually PLAYING this rubbish?! I can’t even. I CAN’T EVEN. People make my head hurt..
Blown away it’s lasted this long after its relaunch, the first incarnation tanked pretty quickly. I am seriously surprised that this game is still going on good for them. At the time when this game was in beta there were so many other f2p mmos releasing as well. So many mmos so little time.